Marble Meenakari Lantern offered compromise beautiful and mesmerizing range of lanterns made available by us in perfectly hand crafted finish. Developed from handpicked natural stones, these lanterns are best choices for adding a natural beauty to the surroundings. Further, the use of stones in different colors as well as smooth surface finishes of these pieces also makes them best choice for showing light and adding desired light and warmth to the surrounding environment. 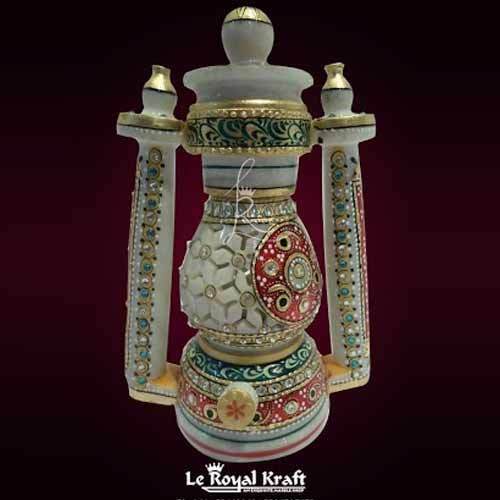 We, Le Royal Kraft, established in the year 2003, are among the prominent manufacturers, suppliers, traders and exporters of an extensive array of best in class Marble Statue & Handicraft. The statue and handicraft range offered by us is inclusive of Marble Durga Statues, Marble Ganesh Statues, Marble Laxmi Statues and many more. The marbles, which are best in the market, are used for crafting and designing these statues by our team of creative craftsmen. By using advanced crafting tools and equipment, our craftsmen design these statues and handicrafts in compliance with the prevailing market trends. These statues and handicrafts can be customized as per the requirements provided by the customers. Available with us at affordable prices, these statues and handicrafts are known in the market for their elegant design, impeccable finish, smooth polish, excellent sheen and eye-catching appearance. Our customer-centric approach, ethical business practices and ability to meet the bulk orders, have helped us in attaining a commendable position in this domain. Being a quality conscious organization and a renowned name in this domain, the optimum quality of the offered statues is never compromised upon and is attained at all times. To ensure timely delivery at the customers end, we have set up and maintain a wide & well-connected distribution network. Easy and multiple modes of payments are offered to our valuable customers such as cash, DD, online, wire transfer and RTGS. We offer our products globally to our valuable clients.